Tag your equipment with a rugged tag that's ready for a tough industrial environment. 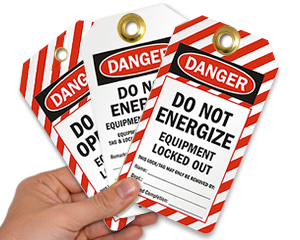 These resilient vinyl tags mark your out-of-service equipment to prevent unsafe operation. • OSHA requirements are fulfilled, so you have the most compliant tag set to promote safety. • Out Of Service blank tags are made from rigid vinyl with a uniquely smudge-resistant, writeable surface. 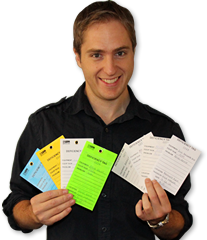 • Versatile equipment tags are sold in packages of 25. • Hefty 15 mil thick vinyl material outlasts others. • Tag is reusable and waterproof. Vinyl is loaded with UV inhibitors. It is great for outside use. • Most tags come with a 1/4", 3/8" or 7/16" (inside diameter) brass eyelet for increased pull strength. Attach tag with wires or a plastic tie.